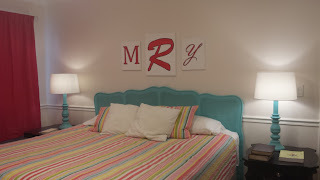 This is my version of putting our couple monogram over our headboard. I really didn't want to do vinyl letters (although I could have with my silhouette) and I definitely didn't want to make it more permanent by painting directly on the wall. So I bought some canvases at Hobby Lobby. I still have gesso and acrylic paints from my interior design days ago I prepped the canvases. Tips​​ chose the fonts and then I sized them on photoshop to fit the canvases. Then I hooked the laptop up to the projector, had Tips hold the canvases so I could trace the letters. Then I painted them on (two coats) - that was my first time ever painting anything on a canvas! I got some paint outside of my pencil lines and was disappointed I could see pencil lines through my first coat, so Tips suggested I outline with a black marker. He pulled out my blackest Chartpak marker (also from interior design days) and that's what I did today! Turned out pretty good I think! And to think, Tips never had my professor TL tell him, "There's no such thing as accidents in life, just opportunities for embellishment."